Nothing was found in Lida. Try to find it 150-km nearby. Review Recommend! Interesting interior (mega-comfortable sofas in the smoking area), friendly service and most importantly - the kitchen. Thank you, fed tasty, satisfying and inexpensive. 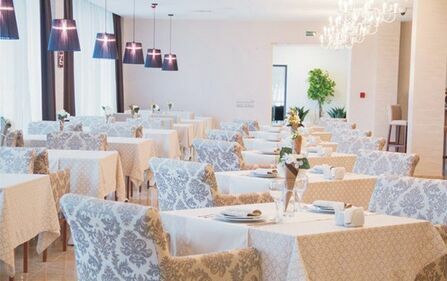 Review Absolutely accidentally brought fate to the restaurant of the hotel "Aqua-Minsk" on 10.02.2019. Wonderful comfortable and bright room, but most importantly, very attentive staff. Despite the fact that there were not many employees (an administrator and two waiters) and a group and four tables sat in the hall, we did not go unnoticed. The waiter immediately approached us, helped in the choice of dishes and after 15 minutes we were already eating salads. Thanks to the cooks for delicious dishes. We wish you continue to keep it up! Be sure to come here again and I will recommend to my friends. Review The food is absolutely delicious, the desserts melt in my mouth. The staff was very helpful. Thank you! We enjoyed visiting this restaurant! Review 02.24.2018 celebrated anniversary in your restaurant. Everything was just wonderful !!!!! I am very grateful to all the staff of the Avignon restaurant !!! The highest level - delicious food, excellent service, interior, etc. All guests are delighted! Thank! Review Perfect place. Everything is very delicious. Interesting food. Great combinations. Fresh food. Knowing their job waiters. Review Were at dinner today. We ordered pad thai and noodles with shrimps. Instead of fallen, they brought some not clear sticky cold noodles with dry pieces of chicken. Noodles with shrimps are not brought at all! Forgot just. About apologies and compliments were out of the question. No more coming. Review I would like to thank all the staff of the restaurant, you made our wedding incredible and unforgettable! Separately, highlight the desire of the Administrator Veronica rarity when you meet such a sincere and warm person, as well as an Oscar waiter !!! You always worry that all the guests would be satisfied and most importantly not hungry people left - Administrator Veronika made an excellent menu everything 50% of the food was left on the second day, which we did not expect !!! Many thanks to the Restaurant Promenade for the warm welcome and the excellent organization of our wedding !!!! We advise everyone !!!! Review We come here to eat, the chef is wonderful, the portions are big, hearty, everything is very tasty and meat and fish and vegetables, there is no place in Minsk with such prices and such a kitchen, the waiters are nice, I will recommend to all my friends. Review We celebrated a birthday in a large male company. Fishing, dancing, having fun. Two days passed like one minute. All accommodated with comfort and had a great time. This was facilitated by the hospitable hosts, the attention to detail, super food - the restaurant is resting. Will definitely be back! Review Gorgeous place! Thanks for the snacks and especially for the best burger! Review Nice interior, delicious steaks and beautiful serving of food. 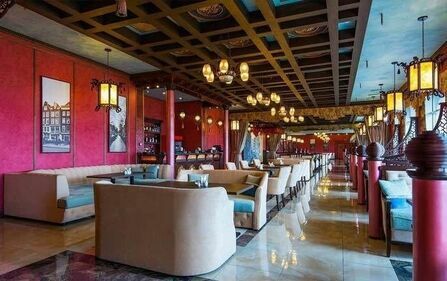 Friendly waiters, will advise dishes and beer for every taste; and bring order to your taste at 100%. Pleasant live music, and I liked everything. I recommend !! Review I liked this spiritual place very much, we sat in a big company, I liked everything, I would like to mention the service, in particular, Valentin and Mikhail. Orders were given quickly, craft beer was also very much enjoyed, henceforth we will only go here !!!! Review Wonderful place, friendly staff. Cozy, warm and homely. Super kitchen - in few places you try it (especially alcoholic drinks - they are superb) Thank you very much! Review We ordered a banquet for 14.09.18. We were met by friendly staff, the dishes were gorgeous, the food is very tasty and there are large portions! The waiter Pavel was friendly and polite! The guests of the institution are also good, the only downside is the girl who was singing, in my opinion she doesn't know how to sing, and everything else was wonderful!Thank you for your hospitality, good tasty cuisine and excellent attitude to guests! I definitely recommend this place! The prices correspond the quality!!!! Special thanks to chef Vadim and waiter Pavel. Review A terrible experience with lunch on Saturday. More than an hour waiting for a burger and a pasta. The burger was tooo salty, the fries were half-cooked, one big salad leaf was rotten. Pasta was below average. And... no sorry from stuff. Review Wonderful place! Delicious kebabs, excellent desserts, polite and attentive staff made the usual holiday meal.